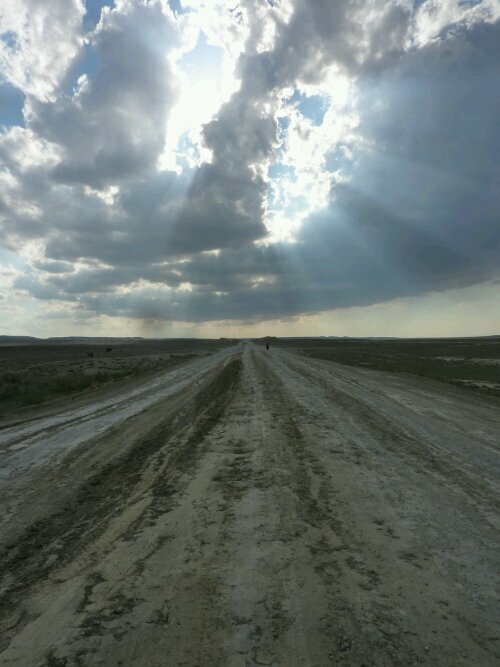 To claim that Kazakhstan passed in a haze of sand and Borat jokes is not be entirely true, but it seems easier and less monotonous than describing over 500km of desert. 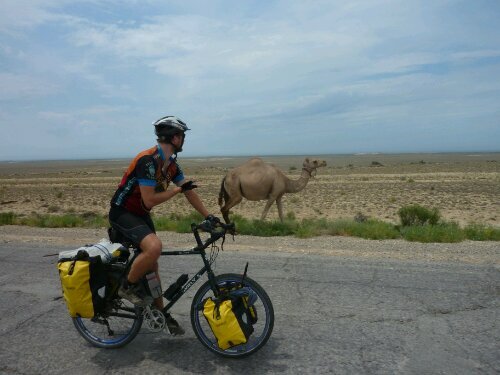 deserts miss the rain” when it rained several times, and finish with the claim that Josh found his bearings in a bazaar in Shetpe- both metaphorically, as he realised how far he was from Manchester, and literally as we purchased some new bearings for his headset. The headline story however, was of our battle with a road so awful that its very existence was regularly called into question. 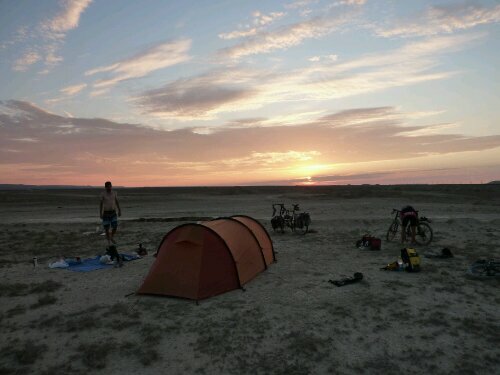 There came a point where we were no longer cycling on a road, but simply using the most popular piece of desert. Indeed, its popularity was often its downfall; the trucks, which represented the only reminder that we still inhabited an age which had advanced past dromedarian transport, had pounded the surface so that it varied between spine-damaging corrugations, and wheel-grabbing sand-traps. 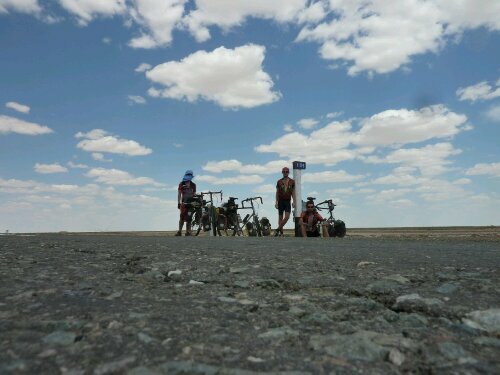 Finally, after traversing over 1000km of desert in eight days, we reached the metropolis of Nukus, where our luck ran out. 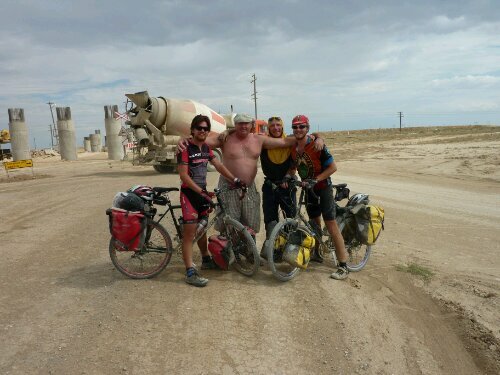 An infected foot which Rob had been nursing turned out to be cellulitis, and our brief halt in Nukus has stretched into days. Fortunately, the town has more in the way of entertainment than one of Syvlio Berlusconi’s birthday parties. The days have flown by, as we eat ice cream, go to the bazaar, visit the art gallery, go to the bazaar, and eat ice cream. What the town itself lacks is more than made up for by its inhabitants. Its occupants include: Sarcien- whose hospitality in inviting us to his home is unparralleled, Nigora- our motherly receptionist who spends her time alternately fretting about Rob and giving us watermelons, Indhira- who has taught us the local Karakalpak tradition of kidnapping the woman you wish to marry, and Eminem (though I suspect this is not his real name) – who dreams of one day visiting Bradford, the hometown of his favourite seventies band “Smokie”. Tough luck on the cellulitus Rob, I fell your pain. I like to think of my concave shin as like a tattoo that reminds me of the trip. Yeah, I thought of you when I found out it was cellulitis. Fortunately, my pain has lessened considerably since half a gallon of bloodand pus exploded from an abscess in my foot. JOSH….YOU ARE MORPHING INTO UNCLE DAVE !!! Yes, chris is right! you do look like dave. hope rob is feeling better by now. (that nurse didnt seem to be looking at his foot?) cool friends.ah, the international language of alcohol. take care men, hope the next stage is better…..oh, the mountains……oops i forgot. Nice trip and strong mine to do it like you by bicycle! See you again on the road. Sorry, I only just saw your comment. Hope everything went well for you. Maybe one day we will cross paths again!